A fast-moving brush fire prompted evacuations and burned at least one structure in the Lower Lake area near Clear Lake Wednesday afternoon. 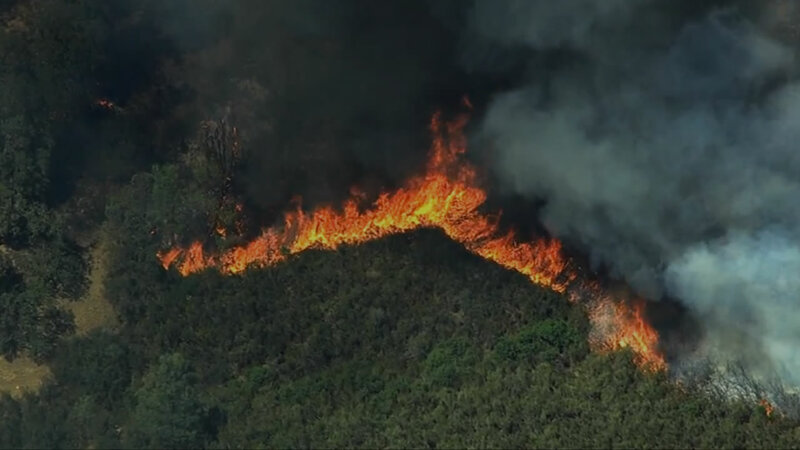 CLEAR LAKE, Calif. -- A brush fire that has grown to 150 acres prompted evacuations in the Lower Lake area near Clear Lake in Lake County this afternoon. Calfire has dispatched six air tankers and at least 200 firefighters to fight the flames. The fire broke out in the southern part of Clear Lake, north of a fire burning near Lake Berryessa. Officials say at least one structure caught on fire on Rocky Creek Road in Lower Lake. Thousands have been evacuated from the path of the Rocky Fire, a massive wildfire that started burning near Clear Lake on Wednesday, July 29, 2015. The explosive fire is now burning in three Northern California counties -- Lake County, Colusa County, and Yuba County. Residents are being asked to stay away from the area, so emergency personnel can concentrate on fighting the fire and evacuate residents.